Once stuffed into the garage or basement along with all the other things you want to hide away, your laundry room is likely capturing more of your attention lately. If you’re contemplating ways to maximize its impact in your home, you’re right on trend, as this room has joined the list of spaces that homeowners want to be both functional and show-off-able. According to ThisOldHouse.com, we spend an average of eight hours doing laundry each week—and together are responsible for washing, drying, and folding 35 billion loads of laundry annually—so why not devote effort to improving this time-consuming experience? From snazzy sinks to storage solutions to how-did-I-ever-live-without-this-before extras, laundry rooms are decidedly more swoon-worthy these days. Here are nine trends that will make you want to call dibs on laundry forevermore. 1. Make it command central. The laundry room has become the ideal spot for the family message board (whether chalk or cork board variety; frantically scribbled or artfully penned). It’s the place for organizing mail and jotting grocery lists; wrapping gifts (gift-wrapping stations are more commonly requested of contractors) and corralling tools, sewing supplies, sports equipment or cleaning supplies. 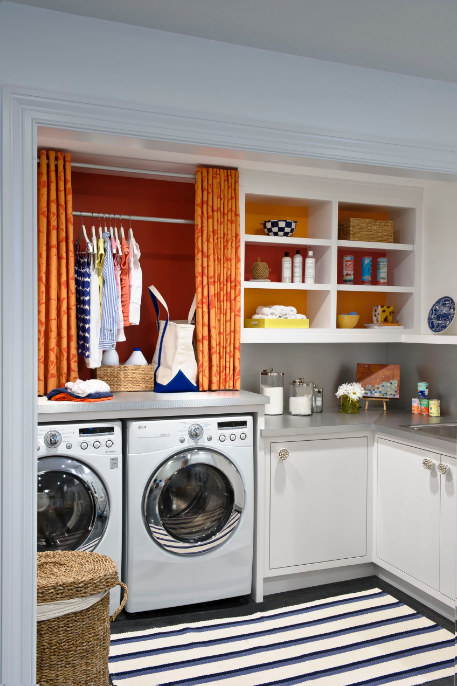 Laundry rooms are also sharing space with mud rooms, craft rooms, home offices, and even pets. For your four-legged friends, you may consider installing a washing station or a cubby for a pet bed or cat box. In other words, create a general get-stuff-done room. Most homeowners still prefer their laundry room close to the kitchen, or to at least reside on the same floor as the kitchen. Others are now choosing to install a laundry room within their master closet, off the master bathroom or in a hall closet—which makes great sense when considering that clothes and towels can go straight from the dryer into nearby bedroom and bathroom closets. Still another increasingly popular option: Hide your laundry room in plain sight, installing your front-loaders directly in your kitchen and cleverly concealing them behind custom cabinetry. 3. Upgrade your utility sink. A laundry room sink is one of the handiest of amenities, as homeowners use them to wash hands, hand-wash delicate items, spot-treat laundry, pot plants, and even bathe their pets (if the sink is big enough or the pet small enough). The best part: Homeowners are more likely to get creative when it comes to their laundry sink, hence Pinterest’s plethora of quirky galvanized-pails-turned-laundry-sinks and throwback apron-front sinks in this room. Select a sink that holds up to bleach and harsh chemicals: Hard-working NativeStone®, stainless steel, or fireclay are some popular options. With laundry rooms growing more lovely by the minute, homeowners are looking to actually stay in the space to fold laundry. That—and the newfound prevalence of front-loaders—has made the over-the-washer-and-dryer countertop a new must-have for homeowners. Whether crafted of warm butcherblock or luxe marble, this countertop can help make use of an otherwise wasted space. Unless your washer and dryer are on top of pedestals, they will likely be anywhere from 36 to 42 inches tall, an ideal height for most people to comfortably fold clothes. 5. Build in storage solutions. Do you need a laundry room that doubles as a linen closet? Do you need it to store not-particularly-attractive household items like lightbulbs, batteries, and tools? Or do you plan to use it to display your favorite striped beach towels and splashy, out-of-season throw pillows? Your answers to these questions will dictate whether or not you choose open storage (shelves and cubbies) or cabinetry to stash your stuff. Make your laundry room work for you with cleverly hidden extras such as a retractable ironing board, a pull-out hamper, or a drying rack camouflaged to look like a drawer. Have fun with tile, wallpaper or shiplap—or go unabashedly girly. If you think you’ve been seeing more chandeliers, florals and feminine touches in laundry rooms, you’re not imagining things. Fair or not, according to the Bureau of Labor’s American Time Use Survey, “On an average day, women spent … four times as much time doing laundry as did men.” If this applies to you, we say decorate this room precisely the way you want. 8. Let the sun shine in. Who wants to be shut into a dark cave eight hours a week? Windows will make a natural-light- and breeze-filled laundry room a reality, and make this seemingly constant task more pleasurable. If you take Pinterest too seriously, you’ll be putting cut flowers in your laundry room in no time. While that’s not practical for the average person, there are plenty of ways to add personality to the most functional of spaces. Think pieces bright or whimsical (a favorite piece of art or a “Lost Socks” hanger; HGTV star Joanna Gaines sells the latter through her Magnolia Market; website and keeps one in her own laundry room). Or jettison those garish plastic containers by decanting your liquid laundry detergent into a glass drink dispenser (World Market has a great option).